Pete is not your average kitty. He's a cool cat whose stories are inspired by the real-life cat of author-illustrator James Dean. As Pete the Cat books continue to make the New York Times bestseller list, their popularity is exploding. Art was in James Dean's heart from early childhood, according to his website. Although he earned a degree in Electrical Engineering, his love of art took over and he left his engineering day job in 1997 to become a full-time artist. It wasn't long before he began drawing pictures of his adopted black kitten and sidekick, Pete. Instead of painting Pete black, he drew him blue. Pete's antics led to more and more drawings and a series of children's books published by Harper Collins. Pete the Cat books are early readers and picture books suitable for children ages four to eight. Since the books' vibrant pictures and catchy songs are appreciated by kids of all ages, the series is a great choice for a bedtime story. Following is a list of published Pete the Cat books. All books may be purchased on Harper Collins' website, Amazon, and at most bookstores. Pete the Cat I Love My White Shoes (written by Eric Litwin): This story follows Pete as he takes a walk in his new white shoes. Along his journey, the shoes turn different colors and get wet as Pete encounters various messes. Pete the Cat Rocking in My School Shoes (written by Eric Litwin): In this book, Pete moves and grooves in his school shoes on the school bus, in the classroom, in the school library and on the playground. Pete the Cat and His Four Groovy Buttons (written by Eric Litwin): When Pete loses one of four groovy buttons on his favorite shirt, he doesn't get upset but does a countdown while singing a song. Pete the Cat Saves Christmas (written by Eric Litwin): This story is based on The Night Before Christmas and teaches kids that giving is the best part of the holiday. 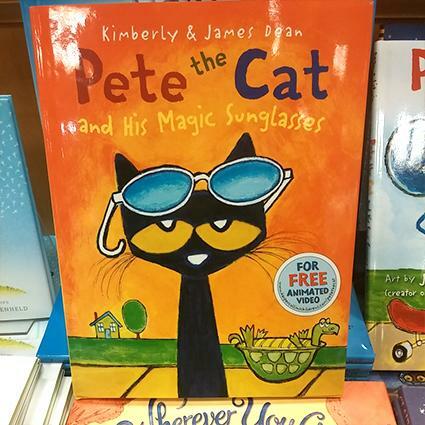 Pete the Cat and His Magic Sunglasses (written by James and Kimberly Dean): After waking up grumpy, Pete discovers, with the help of magic sunglasses, that the ability to be in a good mood is always within him. Pete the Cat and the New Guy (written by James and Kimberly Dean): Pete is excited to meet Gus, the new guy in town, but discovers he is different. Pete realizes that Gus is a cool dude and everyone is special and has unique talents. Pete the Cat's Groovy Guide to Life (written by James and Kimberly Dean): In this book, Pete the cat shares his favorite quotes and bits of inspiration for living a positive life. Pete the Cat and the Bad Banana (written by James Dean): Pete decides he has eaten his last banana after biting into a bad one. But since he likes bananas, he wants to eat them again. Pete the Cat Too Cool for School (written by James and Kimberly Dean): This book follows Pete as he considers which cool outfit to wear to school. Pete the Cat A Pet for Pete (written by James Dean): Pete gets a goldfish and draws a picture of it. Soon, all his friends want a picture too but he doesn't have time to draw so many. Instead, he comes up with a cool solution. Pete the Cat Pete at the Beach (written by James Dean): This book follows Pete as he spends a day at the beach. He has fun playing in the sand but it's hot. To cool off, Pete must confront his fear of getting into the ocean. Pete the Cat Pete's Big Lunch (written by James Dean): At lunchtime, Pete creates a yummy and unique sandwich. This book teaches readers about the joy of sharing. Pete the Cat Play Ball! (written by James Dean): Pete gets a mitt, a baseball bat and hat and sets out to play baseball with his team, the Rocks. He keeps an upbeat attitude when things don't go well. Pete the Cat The First Thanksgiving (written by James and Kimberly Dean): This lift-the-flap book features Pete the Cat starring in his school's Thanksgiving play. The book features 13 flaps that open to display a fun surprise. Pete the Cat Big Easter Adventure (written by James and Kimberly Dean): Pete helps out the Easter Bunny in this activity book that includes a poster, stickers and punch-out cards. Pete the Cat Valentine's Day is Cool (written by James and Kimberly Dean): Love is in the air as Pete makes Valentine's for everyone in his life. When he realizes he forgot one, he still makes Valentine's Day special. Book includes a poster, stickers and punch-out cards. Pete the Cat Cavecat Pete (written by James Dean): Pete takes a trip back in time and shows carnivores and herbivores that they can get along despite their differences. The book includes 30 stickers. Pete the Cat Construction Destruction (written by James Dean): Upon realizing the playground is in need of repair, Pete gathers construction workers to build the coolest playground ever. Book includes 30 stickers. Pete the Cat Rock On Mom and Dad! (written by James Dean): Pete finds a groovy way to show his love and thank his parents for always being there for him. Book includes 30 stickers. For each of the following books, Pete the Cat stars in a beloved classic song that children will enjoy singing along to. Each book is written by James Dean. Thanks to his enormous popularity, Pete the Cat has branched out into products other than books. Pete the Cat Soft Toy: This plush toy is perfect for any Pete the Cat fan. It's 14.5" tall and suitable for kids ages four to eight. The toy costs $14.40 at Target. Pete the Cat and His Four Groovy Buttons Hand Puppet: The perfect pairing with the book of the same name, this puppet is dressed in Pete's favorite yellow shirt with groovy buttons. The puppet costs $14.95 at Barnes and Noble. Pete the Cat Pajamas: Kids will love going to bed in Pete the Cat pajamas. This pair has fun pictures from the books, is made of cotton and is available in sizes 3T through Kids 6. The pajamas are $36.95 on Amazon. Pete the Cat Puzzle: This two-sided, 36-piece suitcase puzzle features Pete's cool guitar and is suitable for kids ages three and up. The puzzle costs $15.26 at Walmart. Pete the Cat Groovy Buttons Game: In this game, kids lose and collect buttons as they move along the board. The kid with the most buttons at the end of the game wins. Cost is $14.99 at ToysRUs. Kids and adults alike love Pete the Cat. In fact, Dean's first book of Pete illustrations, The Misadventures of Pete the Cat, was intended for an adult audience. Dean's whimsical illustrations and fun settings were ripe to be made into children's stories and he and his fellow authors did not disappoint. As more books are published, the series will likely continue to be a hit.